Russia warned the United States today that its support for the opposition in the Latin country of Venezuela could lead to bloodshed. Of course, that is not the Kremlin’s real concern. Russia’s support in keeping Venezuelan dictator Nicolas Maduro in power has caused much bloodshed and suffering. Moscow’s real worry is that U.S. President Trump will prevent Russia from establishing a coveted bomber base in America’s hemisphere, and also that President Putin would come out on the short side of the stick in world opinion, meaning, Trump would emerge the winner in the battle over Caracas. US recognition of Venezuelan parliament speaker Juan Guaido as interim president represents “flargant interference into the internal affairs of another country and imposition of US hegemony,” chairman of the Russian State Duma’s International Affairs Committee Leonid Slutsky said on Thursday, reported Russian state news agency TASS. “The US continues its policy of external pressure and interference into the affairs of sovereign states. Now it is Caracas’s turn… It does not look like protecting democracy at all. This instead represents another forceful imposition of US hegemony and scrapping of unwanted regimes,” Slutsky said. “Only Venezuelan people should decide who will be the country’s president, and they should decide it only via elections,” he added. “As we know, on January 10 President Nicolas Maduro was inaugurated and became the legitimate head of state. However, the US continue to bet on the opposition leader with manic persistence as they believe he will replace Mduro and lead Venezuela on a pro-US course. Thus, the US hopes to break down one of the few remaining Latin American strongholds of resisting the concept of unipolar world,” Slutsky noted, added TASS. American presidents have a long history of preventing then Soviet, now Russian, leaders from attempting to set up shop near American shores in Latin America. The Cuban Missile Crisis is a prime example of this agenda. Recently Russia flew several long-range nuclear bombers to Venezuela in a show of support for Maduro, and as evidence of Moscow’s power-projection capability. 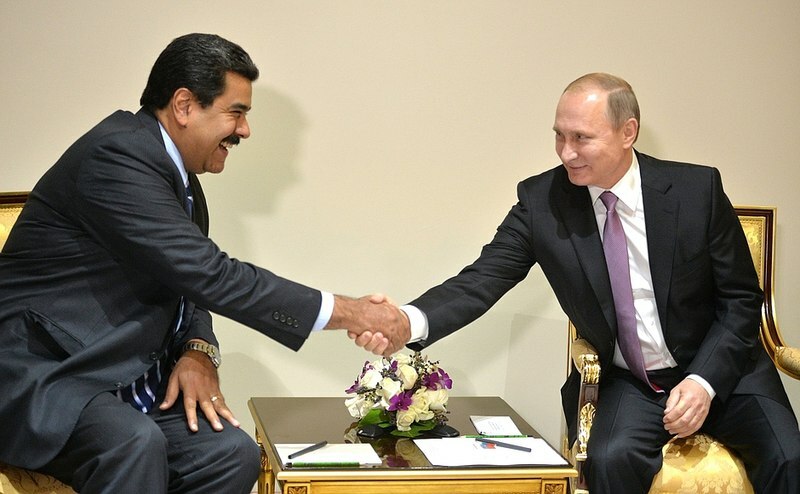 At the time Maduro offered to set up a Russian military base in the Caribbean. Losing Maduro’s control of Venezuela would be a blow to the Kremlin’s and to Putin’s image. Would it be another example of Trump-Russia collusion?